A one-click, customizable web portal for customers to browse, share and buy your books. Unlike other online bookstores, which can take up to half of your books' profits, we do not take any percentage of your sales. Sign up for only $10/month with no hidden fees ever. Receive direct deposits in your PayPal account with each sale. Enjoy fast and simple checkout without any signups required. Easily set your book price and shipping rates from your account. Gain followers by adding social media links to your Booksite. Include a photo and short bio for buyers to learn more about you. Conveniently ship and track your inventory from home. How much does Sales Tools cost? Sales Tools for new customers is $120 for the first year. This cost covers the setup of the Booksite and hosting in our Bookstore for one year. Annual renewal following this first year is $60. Do my books have to be printed by Gorham Printing to qualify? Yes. Only books that have been printed by Gorham Printing will be eligible for Sales Tools. This includes both reprints and new print orders. Can I add wholesale pricing to my Booksite? At this time, Booksite is for retail sales only. When placing your book printing order, we recommend that you retain a percentage of your book inventory to offer at trade discounts to resellers or friends and family. Order returns are the responsibility of the Customer, including both shipping and book cost. Refunds can be made using your PayPal Business Account. Shipping is tracked by the customer using his/her chosen means of shipment. At no point is Gorham Printing responsible for the tracking or recovery of lost shipments. Can I still participate in selling through Amazon? Yes. 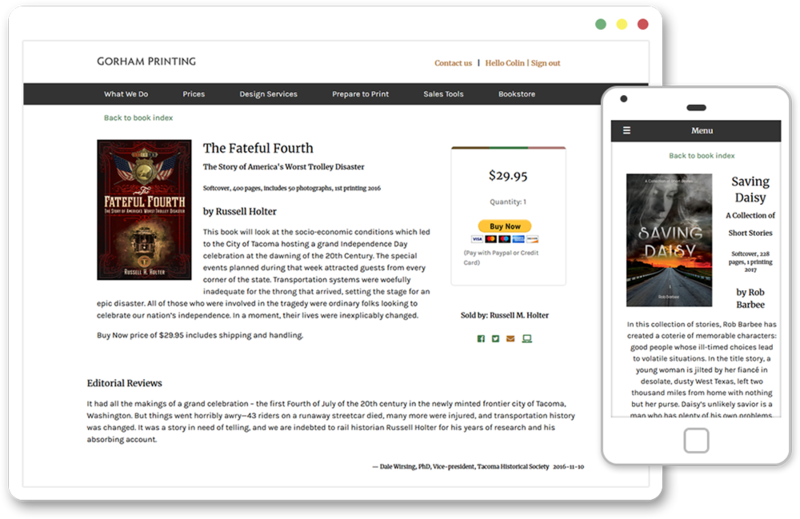 You can sell your book through your Gorham Printing Booksite while also maintaining an Amazon listing. The same is true for any alternative webstore listings for your books. How do I set my shipping cost and tax rates? Shipping and tax rates are controlled by a saved PayPal button that the customer sets during the creation of his/her PayPal Business Account. This button can be modified at any time through his/her account settings. We recommend choosing a flat shipping and tax rate that will cover the cost of shipping to any location in the U.S.
Can I ship my books outside the U.S.? Yes. The customer can decide where his/her books can be shipped using the settings in his/her PayPal Business Account. However, we strongly recommend limiting shipments to the U.S. Shipping outside the U.S. can incur shipping charges much higher than the flat shipping cost set by your PayPal Button. Instead, we recommend including contact info on your Booksite for buyers to arrange custom shipping options for outside the U.S.
Is mobile ordering with Square available for tradeshow sales? No, we currently do not offer integration with Square. However, you may use PayPal Here with your PayPal Business Account to accept payments using a mobile card reader.